and surrounding the Bill Ballantine designed Datsun B-210 we have (from left to right) Ron Severini, Antonio "Tony" Hoyos, Dennis Hall (? ), Ray "Anchor Face" Lesperance, Sandy Severini, Maude Flippen and ? 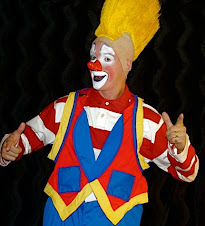 I posted something the other day in the comments section about the importance of a clown's originality in character, material and costuming... I take it all back now. This is "Monsewer" Eddie Gray, certifiable lunatic and member of the notorious Crazy Gang. "Monsewer" Eddie Gray was a stage comedian who performed in Music Halls. He was born on 10 June 1898 in Pimlico, London as Edward Earl Gray. 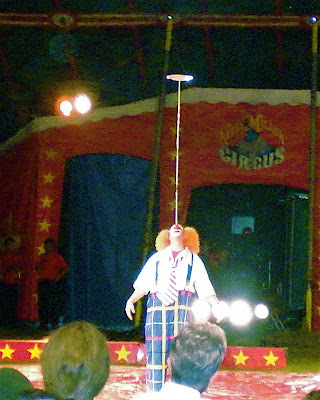 He became a professional juggler, but by the time he was twenty, he had extended to comedy. He discovered what became his trademark of "Cockney-French" while performing in Paris, France, when he spoke on the stage in his very bad French. The audience, however, liked it and he used it in his act from then on. 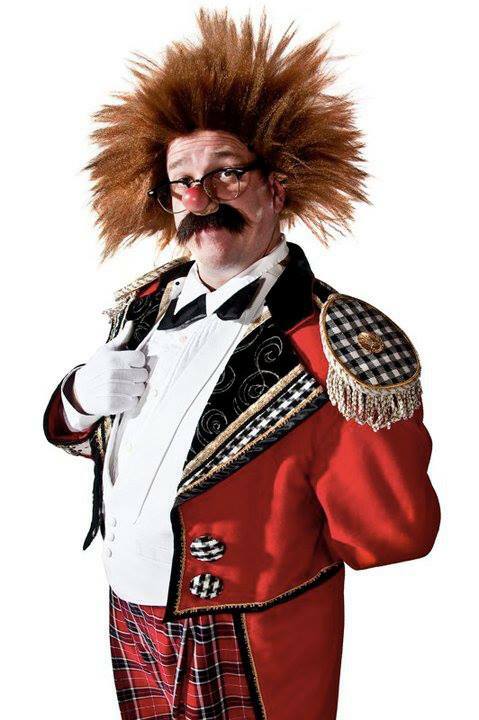 His stage costume included a pair of horn-rimmed glasses and a looped moustache. 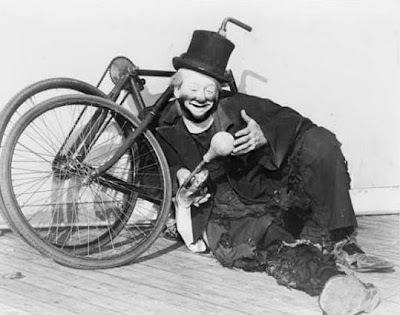 He joined with the comedy pair Nervo and Knox in the Crazy Shows, but went solo in the early 1920s. He rejoined them again in 1957 when he was associated with the Crazy Gang shows at the Victoria Palace Theatre in London. He married Marie Loftus Jones in 1927 and they had two sons. He died on 15 September 1969 in Worthing, Sussex. Bobby Kay and Lou Jacobs, most likely taken at Bobby's 69th birthday party. 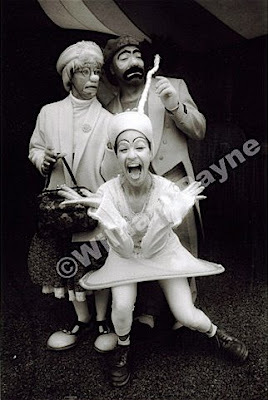 For more of Bill Payne's amazing circus photographs please click here. 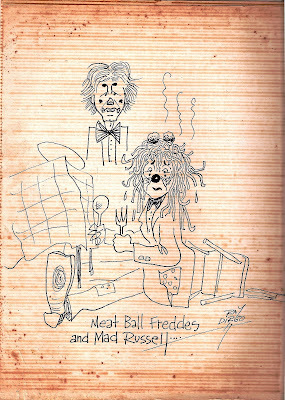 John Russell and Mitch Freddes restaurant gag imortalized by Ray Dirgo. 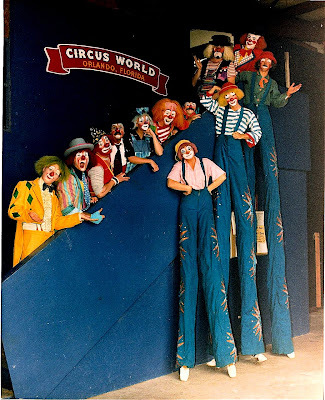 Sadly, Ringling no longer employs this many clowns across all three of it's current units and any one of the clowns in the photo used more makeup on a three show Saturday than the current Alleys will use all season. Many very healthy babies have been thrown out with far too much crystal clear bathwater in the pursuit of "updating" what should be "timeless". 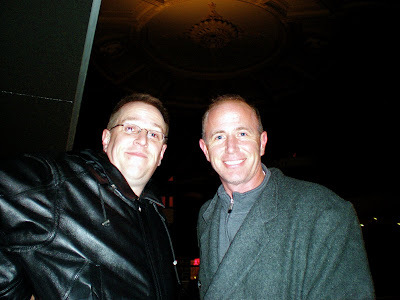 Me and Robert "Mr. Robb" Zeiser on the night of Feb. 1st, 2008 at the AMC Empire 25 on 42nd St. 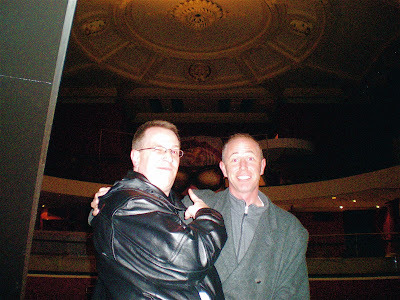 The building that houses the lobby is the former home of the Empire Burlesque and Robb and I are standing on what was the stage where Abbott and Costello first appeared as a team. 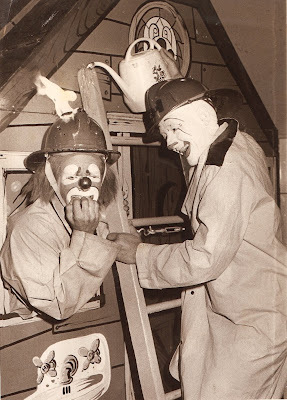 Any of the NY area clowns ready to hang again? Clyde Beatty Circus performers at the back door, 1946. 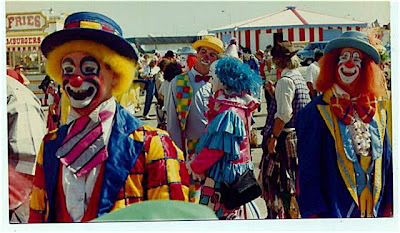 The clown on the far left is Art Cooksey. On the far right we have Hughie Kyle. Anyone recognize anyone in between? I was going through some pictures last night and came across this one that I hadn't yet posted. 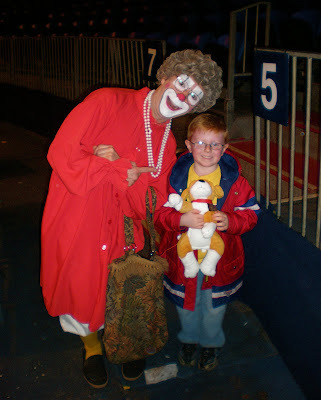 It's a photo of Shane with Grandma (Matthew Pauli) on a recent visit to the Big Apple Circus in Bridgewater, NJ. Werner Groebli, who as Frick of the famous ice-skating comedy team of Frick & Frack, cracked up and wowed audiences for nearly 30 years with tricks like skating in circles while bent backward at the knees so that his body hovered almost parallel to the ice, died April 14 in Zurich. He was 92. David Thomas, one of Mr. Groebli’s skating partners after the original Frack, Hansruedi Mauch, retired in 1953, announced his death. The cause was complications after breaking a leg at a nursing home outside of Zurich. 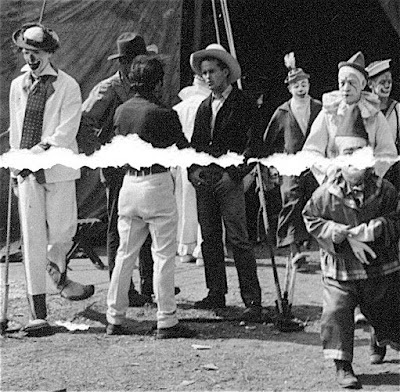 Soon after they first met and started acting silly together at a local rink in Basel, Switzerland, in 1936, Frick & Frack became famous, captivating crowds with 8- to 10-minute routines. A British producer caught their act in St. Moritz and signed them for a show in London; soon Hollywood called, and big American ice shows. After Mr. Mauch retired, the act became known as just Mr. Frick, with a series of partners playing second fiddle. Frick and Frack were both virtuoso skaters, but the usual smooth flow around the rink was not for them. Mr. Groebli, in particular, reveled in square, stiff, clockwork-like moves, particularly evident in his toy soldier routine. 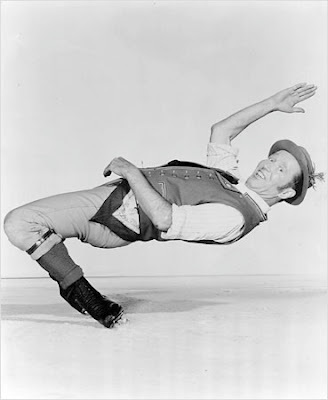 Or Frack would toss Frick an invisible rope and, seemingly without moving a muscle, Frick would slowly glide forward as though being pulled, the propulsion coming from pressure on the outer edge of his skates. Or the two would skate by each other, missing a handshake, hook their legs, recoil and turn back face to face. Mr. Groebli’s trademark move was that spread-eagle cantilever, bent backwards inches above the ice, from which he would rise by attaching his bamboo cane to an invisible hook in the air to hoist himself up, hand over hand. Frick & Frack were particularly popular in the 1930s and 40s, when the Olympic champion figure skater Sonja Henie became a Hollywood star. Their lasting fame had something to do with the act’s name, which has entered the language as a synonym for two inseparable friends. But they were almost Zig and Zag. 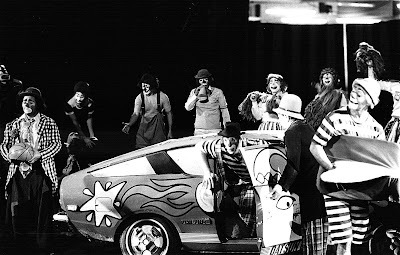 Those were the first monikers they used when trying out clown routines as teenagers in Basel, their hometown. They used fictitious names because their parents did not approve of their carnival-like careers. “I was to follow a career in architecture, and Frack’s parents wanted him to be a banker,” Mr. Groebli said in an interview in March 1999. Why Frick and Frack? No particular reason, Mr. Groebli said. Frick, he added, is a small town near Basel; Frack means frock coat in the region’s patois. Frick & Frack performed in London in the 1930s and came to the United States in 1938 as part of the St. Moritz Express ice revue, which performed in the open-air Tropical Ice Gardens in the Westwood neighborhood of Los Angeles, and on the road. They were paid $200 a week and given the opportunity to improve their English as well as the hope that they might break into movies. In 1939, they were hired by the original Ice Follies, which they stayed with for 11,000 performances. The pair and their slapstick routines, with mock collisions and blade-close misses, reached the height of their popularity in the 1940s, when Frick & Frick appeared in two films, “Silver Skates” (1943) and “Lady, Let’s Dance” (1944). Werner Fritz Groebli was born in Basel on April 21, 1915. He is survived by a sister, Gertrud Zuberbuhler of Basel. His wife, the former Yvonne Baumgartner, died in 2002. After his retirement, Mr. Groebli was named to the United States Figure Skating Association’s international hall of fame in Colorado Springs, Colo. Mr. Thomas, who was Mr. Groebli’s ice partner from 1973 to 1978, said he brought a quirky spontaneity to his performances, especially when something went awry. “If the spotlight was off the mark, he would do a silly little dance to find it,” Mr. Thomas said. “If he fell, he would jump up and look around to see who tripped him. Mr. Groebli also liked to know exactly how long the crowd applauded. Nick Ravo contributed reporting for this article. To view the original NY Times article, please click the title of this post. 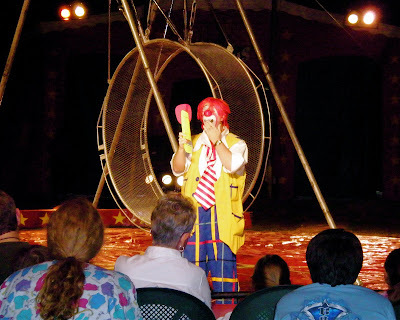 Danise Payne, Robert "Onionhead" Dunn & Solange on the UniverSoul Circus. John Russell (mostly clothed) and Mitch Freddes (mostly not) backstage on the Ringling Red Unit. I'd imagine that it was taken no later than 1977 from the beautiful Bill Ballantine drum head in the foreground. 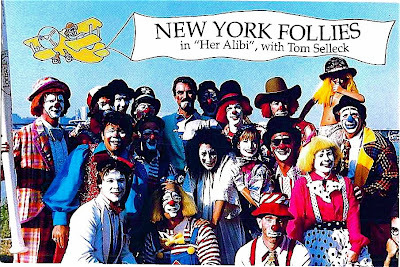 Michael Bongar (who I got to chat briefly with at a gig a few weeks ago) and his New York Follies' clowns (featuring Billy Vaughn at right) during the filming of the film Her Alibi, seen here with the film's star Tom Selleck. Horsman and I think that might be Bernie in front of Billy Vaughn. I thought that that was Ken Horsman, I didn't recognize Bernie. Can anyone else out there identify the folks in the photo? 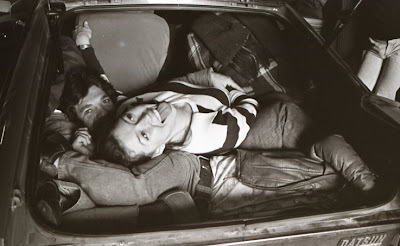 Ruth Chaddock and co. stuffing the clown car in the winter/spring of 1977. 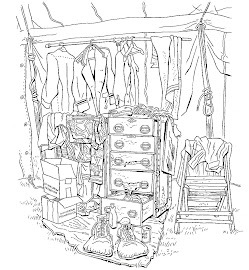 According to "The World of Clowns" by George Bishop, where there is a photo of the 1943 alley this is Hughie Kyle (though I know there are several mis-namings in this book). 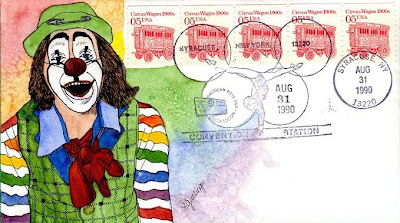 Manuel Marcos "Zapata" Barragan Jr. as seen by an artist who looks to have signed their work "L. Geerlings" on this First Day of Issue postcard. 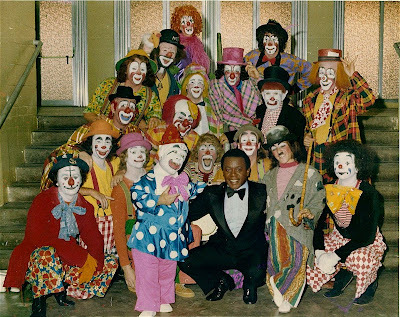 Ringling Bros. and Barnum & Bailey Blue Unit Clown Alley 1974. 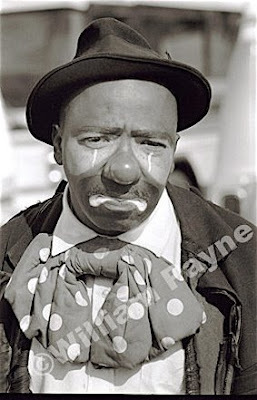 Robert "Onionhead" Dunn, a beloved fixture on the UniverSoul Circus. 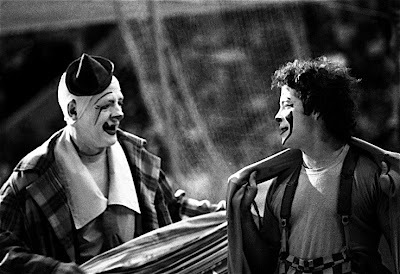 Some some controversy has arisen as to the identity of the tramp clown in yesterday's Circus World photo from Billy Vaughn. Kenny Ahern, quite respectfully, contends that it is not Bill Hamilton as identified by Mr. Vaughn. Would like to learn who they are. Maybe someone will get a kick out of seeing these from over 62 years ago. 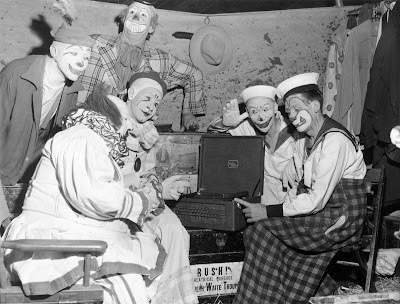 This alley shot of the clowns listening to a phonograph was taken in April of 1946 on the Clyde Beatty Circus. 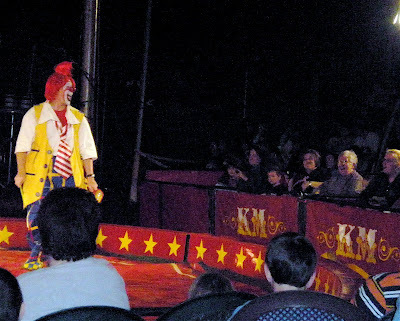 Kenneth Waite is the clown in the white ruffles in the foreground. 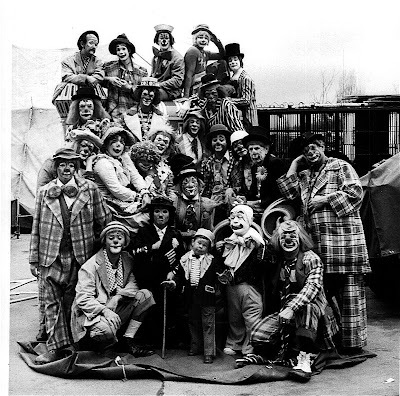 The clown with his hand to his ear (second from the right) is Pinto Colvig. I wonder if they are listening to a Bozo record reader? 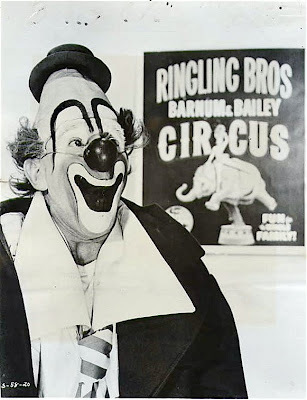 For those who do not know, Pinto was a circus clown who worked as a gag and voice man for Disney (where he co-wrote the smash hit Who's Afraid of the Big Bad Wolf?) and the Max Fleischer studios before moving to Capitol records and becoming the original Bozo the Capitol Clown. 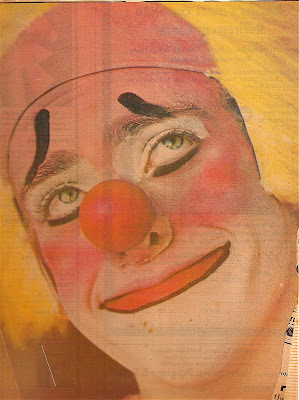 Pinto is the father of Vance Colvig, the KTLA-TV Los Angeles Bozo the Clown who we featured here recently. 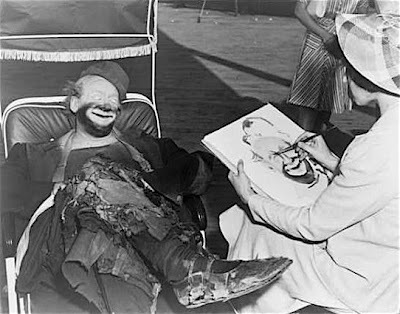 Joe Jackson (possibly Sr. but I would have to guess that it's most likely Jr.) in two photos, first (above) with his famous trick bicycle and second (below) reclining while having a portrait done by Angna Enters at the New York World''s Fair in 1940. So this week we learned that both Abe Goldstein and Joe Jackson appeared at the fair. Anyone out there know if any other clowns appeared? 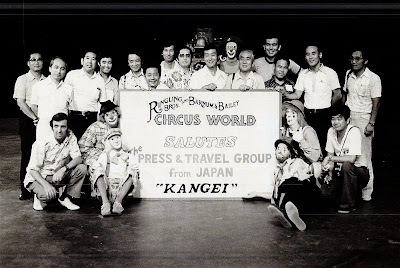 I know that Jackie LeClaire and Ernie Burch both worked the Ringling-produced circus show while Emmett Kelly Jr. worked the Kodak Pavilion at the 1964 NY World's Fair. 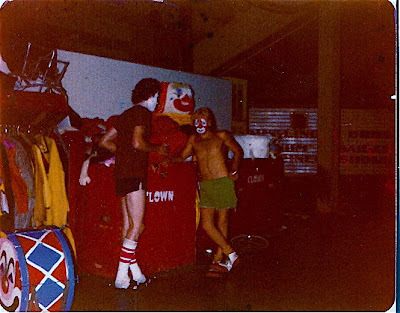 Boss Clown Glen "Frosty" Little and future Big Apple Circus stiltwalking star Jim Tinsman on RBB&B in the winter/spring of 1977. He has gone with me on my clown rounds at Jersey Shore University Medical Center before, but only to play in the playroom. 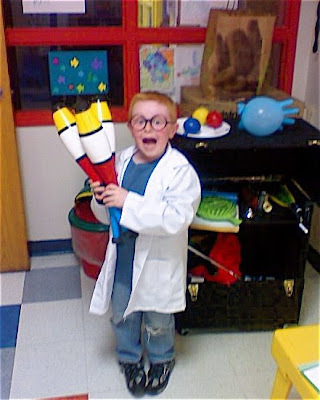 Yesterday was his first official visit as a full-fledged clown doctor! He did a great job blowing up gloves, spinning plates, handing me props, assisting with magic tricks and performing a comedy eye-test routine (based on the structure of Who's On First) that he wrote. He's so proud of it in fact that he finished the bit by telling everyone "That's mine! I wrote that one!" Dean "Elmo Gibb" Chambers on the left, Bill "Mr. Bill" Machtel on the right and (I believe) John Hadfield in the center. 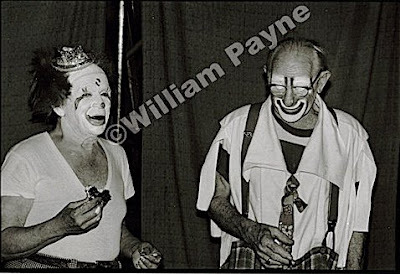 Taken at the Ringling Bros. and Barnum & Bailey Clown College 20th Anniversary Reunion in Venice, FL in 1987. 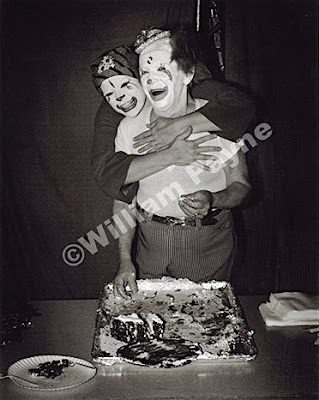 Master Clown Bobby Kay gets a big hug from Peggy Williams on his 69th birthday back in 1978. 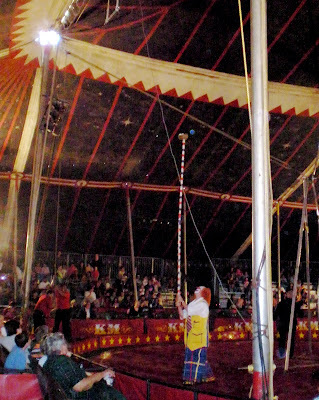 These photographs were taken during my various travels on different circuses through the years. 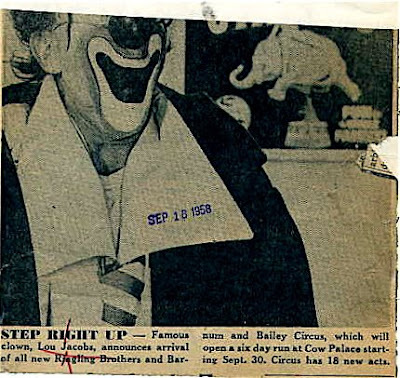 Their time span goes from 1978 (Bobby Kay’s 69th Birthday Party) when I worked with Ringling Bros. Circus until 2003 (Young Dancer) which was taken while I was working on The UniverSoul Big Top Circus. I have had various jobs on these shows. 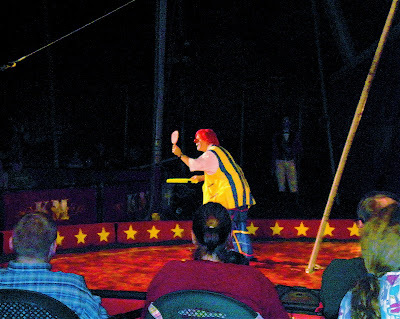 I spent many years as a saxophone player with Ringling Bros. 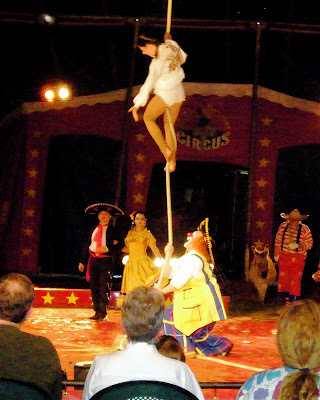 Circus but at various times I have worked as a Roustabout (a working man) which in the circus is the lowest, least paying job on the circus, to prop man, then lighting and sound, stage manager…the list goes on forever! The life (for me) was great. It allowed me to meet some of the most interesting people from all over the world, my life has been totally enriched from the experience. Bill has asked me to leave the watermark on the photos as he's looking into a possible book deal. To visit his site, please click here. 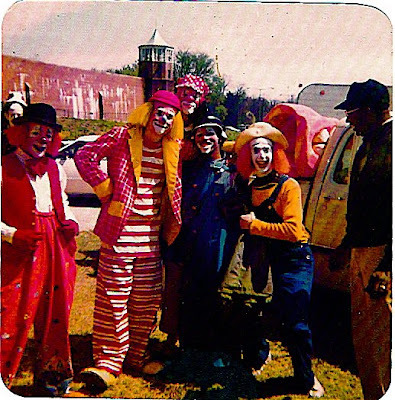 Mitch Freddes, Steve LaPorte, guest clown at Lawton Prison (outside Oklahoma City, OK) and Mickey Gaylor in 1977. 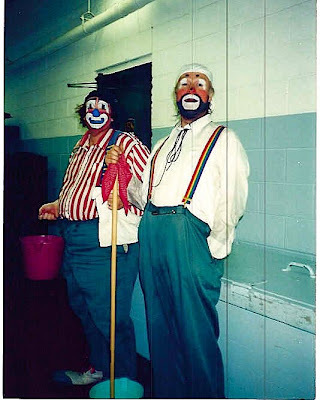 Prison guest clowns??? Explain, please! 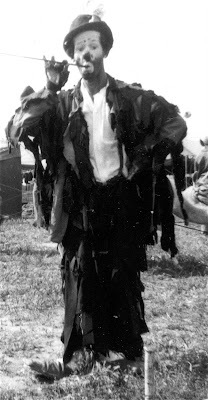 Here is a photo of Frank "Dutch" Luley he was a part of the Edmaond Hayes theatre group in the 1918's playing Burlesque. 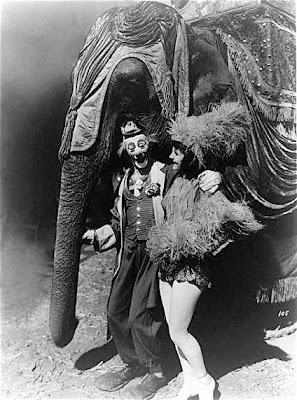 Eadward "Gijon Polidor" Guilliaume on Ringling Bros. and Barnum & Bailey with an unnamed showgirl in an undated photo which looks to be from the late 20s/early 30s. "Mr. Vassallo, Mr. Larible's legal team is on line two..."
Billy Vaughn and Jack Cook on Garden Bros. 1991. 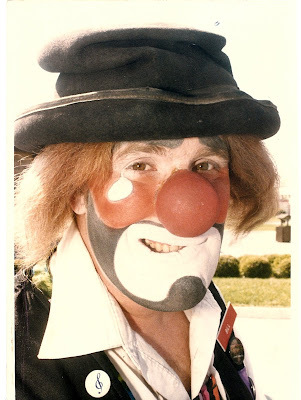 Mitch told me a story on the phone the other day about how he was having terrible trouble coming up with a makeup at Clown College. One day Bobby Kay, Mitch's makeup instructor, told him that he's had a dream the night before about a perfect makeup for Mitch. 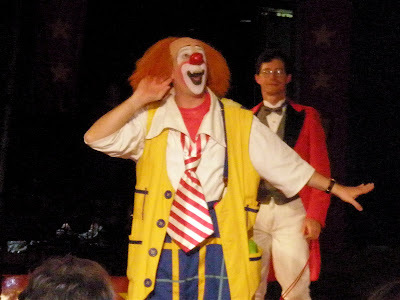 And proceeded to make Mitch up with the above face, the one he graduated Clown College and began his circus career with. 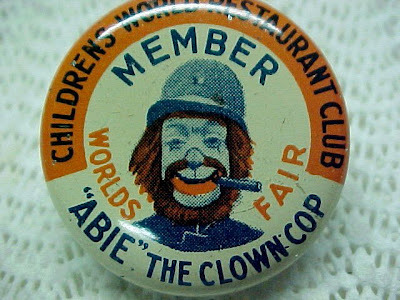 Abe Goldstein's giveaway pin from the 1939 New York World's Fair. Finishing up come-in with Ringmaster John Moss coming up behind me. 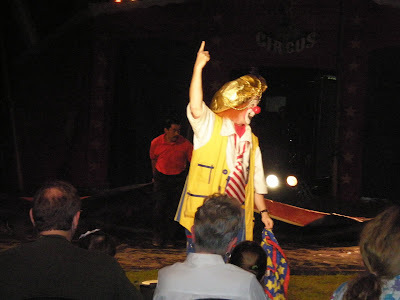 The magic act that I substituted for the American Idol gag at shows where we didn't have the right potential volunteers. I don't think that we had the right potential volunteers at more than a handful of shows. Audience participation gags are tough to pull off "in the heartland". Playing a lovesick mariachi and working with the beautiful and talented Ms. Sara Green in spec. Doing the old Egg Basket gag (borrowed from K-M's "Handsome Harlo") during intermission. My fright wig bit, done at the top of the second act. And (after a little bit of "You Can't Do That Here" while the ring mat gets reset) it's time for some comedy plate spinning, done to the song "Wipeout" by the Surfaris. I hope that Mike had as much fun on the show as I did and that I'll be able to return for K-M's dates in PA, MD, NJ, NY and CT. I apologize for the lighter-than-usual posting this weekend but there was a lot going on around here. Once a month or so we plan a "Secret Fun Day" where Shane has no idea where we are going or what we are doing. Sunday we took Shane to his first rock concert, They Might Be Giants (who now do family-friendly afternoon shows in support of their recent children's albums) at Town Hall in NYC. 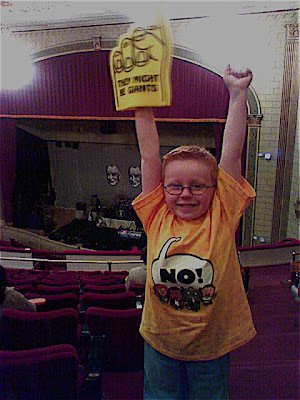 The show was amazing and TMBG, in Shane's words, "totally rocked the house". For more on They Might Be Giants, please click here. Afterwards we went to Mars 2112 where we rocketed to Mars for lunch. 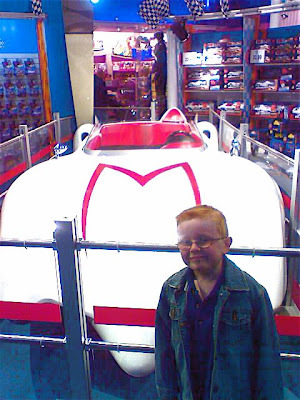 When we returened to New York we visited the massive Toys R Us in Times Square. 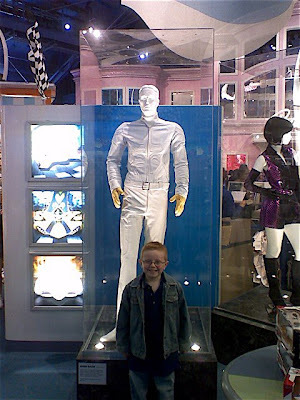 Shane has been to the store before and to see Batman's Batman Begins costume, Superman's Superman Returns costume and various Spidey suits but nothing prepared him for the chance to see Speed Racer's Mach 5. To see what all the excitement is about, watch the the trailer for the new Speed Racer movie by clicking here. 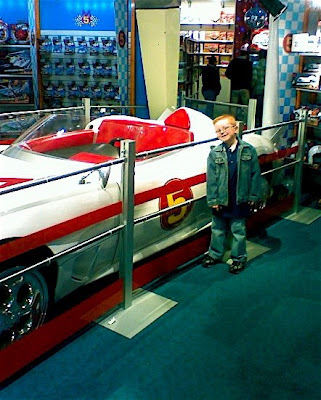 For 40 year old cartoon, Speed Racer is a pretty big deal right now, almost as big as Power Rangers, but he'll have a lot of competition as first Iron Man, then the Hulk and finally Batman all have their movies released this summer. It's a good time to be a five year old boy. Despite the Pope's visit we didn't hit any delays and as we passed through Hoboken on our drive home I caught him resting his eyes in the back seat. "Are you getting tired, Buddy?" "No", replied quite matter-of-factly, "I just have a little bit of sleep glue in my eyes." Today's posts will be delayed until this afternoon as Shane and I are going to spend the first day of his Spring Break at the movies seeing Horton Hears a Who. Mitch Freddes and Frosty Little.